Use the tool you love -- your crochet hook -- to finally achieve knit-look fabrics. Crochet expert Jennifer Pionk shares the techniques she has developed that will allow you to make a beautiful knit-look afghan. Your friends and family will be wondering when you became a knitting expert! Watch over the shoulder of crochet expert Jennifer Pionk as she teaches you the techniques she has developed to create knit-look fabrics with a crochet hook. When she teaches the uncommon slip stitches, you'll be glad you're watching an Annie's video class. You can watch any part of the class as many times as you like until you feel completely confident! Create knit-look ribbing, the checkerboard pattern, waves and more. Control you tension through Jennifer's top secret tips and tricks. Maintain a nice, neat edge. Work common and uncommon slip stitches. Execute the half double crochet in the back bar. Seam squares together with the single crochet stitch. 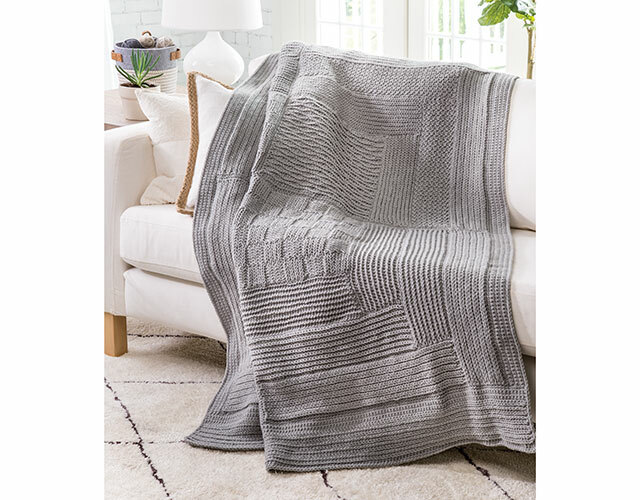 This class includes complete step-by-step instructions for the exclusive Knit-Look Log Cabin Afghan. Nice video to learn the new crochet/knit stitches. I think it would have helped if the rows had been worked in different colours as well as the borders as the total look is a bit bland. I have taken classes from this instructor and enjoyed them all. She is very good at explaining and showing what you should know and do. She also shares some things that are very helpful that are not in every class. I enjoy when the instructor shows how to do the stitches and how to put them together. This instructor was very clear, enunciated beautifully, and spoke at a rate giving time to process her words and at the same time actually stitch the project. I will look for more of her classes--she is a wonderful instructor. I am very anxious to complete this afghan in its entirety. Many thanks to the instructor and to Annie's for offering a quality product.